September is the very best time of the year for eating vegetables. At the Trenton farmers’ market this morning, there were yellow wax beans and green string beans, bursting at the “seams” with their swollen little beans inside; heroic lima beans encased in their sturdy flat pods; long, wide Romano beans (we’ve been waiting for these all summer); bi-color (our favorite) corn on the cob; and just-dug (’cause we dig ’em) potatoes. 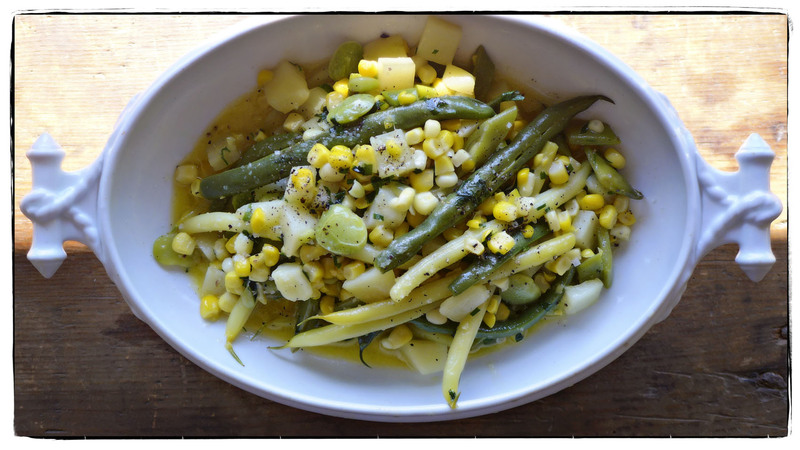 We made a succotash, adding about a quarter of a pound of salted Irish butter (is it wrong?). Eating like this takes the sting out of saying the long, slow goodbye to summer.